When I saw that Class Reunions are Murder is set in Cape May, New Jersey, I jumped at the chance to read and review. I’ve visited Cape May a couple of times while spending time in the Garden State visiting friends (shout out to Craig and Charlene!) and it’s a charming, delightful spot. I always have high hopes for books set in familiar and well-liked locales – I was not disappointed. Class Reunions are Murder is a perfect mix of chick lit and cozy mystery. Lured back to Cape May for her class reunion, Poppy McAllister finds her childhood home in disrepair and her eccentric aunt in danger of being forced into a senior living community. Before she can fully figure out what’s going on with her aunt, Poppy is at her class reunion, pulling her best friend out of a fight with the class mean girl, and wondering if she has time to drag the mean girl’s body away from in front of her old locker before calling for help. Who would have thought that a jailhouse pep talk would be the catalyst for so much change in Poppy’s life? I so enjoyed this story. Libby Klein writes the character of Poppy with wonderfully warm, funny, and charming characteristics. I can’t decide if I wish I were best friends with the author or the character! (Let’s just be greedy and say both Libby and Poppy are my new BFFs.) The mystery is straightforward, yet complex; there are a plethora of suspicious characters who may have reached a breaking point with the meanest girl in school. And, even better, alongside the potential killers are Poppy’s friends, a handsome barista, a still-enamored high school sweetheart, a kooky cat, and the best series debut I’ve read in quite some time. 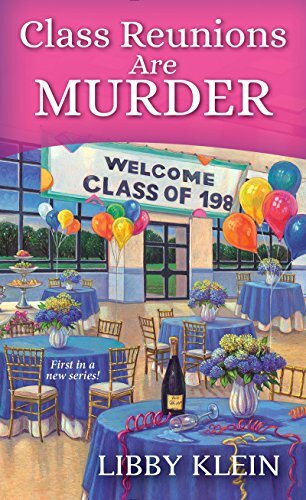 Enter to win a print copy of Class Reunions are Murder! 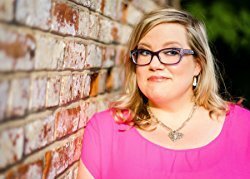 Thank you for your wonderful review on “Class Reunions Are Murder” by Libby Klein and being part of the book tour. Enjoyed reading about the book and would love to be able to read it myself. Thank you, Kay! I really enjoyed this book a lot – I think you will, too! Thank you Celia! I definitely think this book will get you ready for your reunion! Though I certainly hope you don’t have any mean girls – or murderers – to contend with! I really enjoyed the description of the book. Love the Cape May setting. Sounds like a great read. Good review! I’ve never heard of this series before, but it reminds me of the movies on Hallmark Movies & Mysteries. I would definitely give this book a chance by reading it!